In a group brewing session, more eyes and hands make the process a smooth and stress-free endeavour. Couple this with a Braumeister, which ensures that anyone can brew, no matter what their level of experience. Measuring out malts and throwing in hops is the most difficult part of working on a Braumeister, which is an all-in-one brewing machine, a single vessel that operated on a fully automatic control system. They’re easy to sanitise and the malt is kept off direct heat to avoid burning. No racking is required, which is the messy process of transferring wort, usually via a siphon. So it’s a matter of turning it on and letting it transition through every step of the brewing process on a timer. Easy-peasy, right? 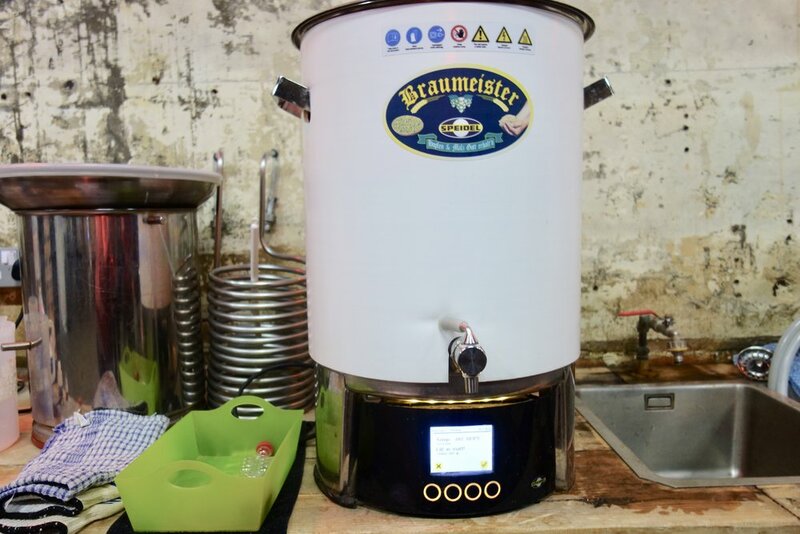 Some might despair that these systems reduce brewing to an automated activity, but this type of all-in-one brewing permits a lot of versatility: it means that budding homebrewers can experiment with a variety of styles and hops. This was the objective of February’s Beer Boars group brew, based at the Brew Club headquarters in Clapton. Under the watchful eye of Tiago Falcone, a seasoned brewer from Beavertown Brewery, attendees made three pale ales. Working on a trio of Braumeister systems, teams used identical malt bills with a different hop in each recipe. This meant that the three distinct hops were the prime focus of each batch and each beer would demonstrate their respective unique characteristics. Mandarina Bavaria (Germany), Azacca (USA) and Nelson Sauvin (NZ) hops were used. Everyone would get two 330ml bottles of each batch to take home, sample and understand the variations between each one. Tiago had never used a Braumeister before, so it was a group learning exercise. Once the malts were weighed and the mashing began, everyone had the opportunity to chat with Tiago about brewing, his job and beer more generally. Experienced homebrewers showed up with their recent trials in tow, sharing the fruits of the labour with fellow attendees. Tiago was happy to give helpful and constructive feedback and seemed genuinely impressed with the calibre of some of these beers; he commended a powerful Russian imperial stout and an IPA that had been – perhaps somewhat graciously – compared to Beavertown’s own session IPA, Neck Oil. But it had the requisite bold juicy flavours and a low ABV to made it an intensely drinkable attempt in its own right. The onsite bar offered some great beers, including Mondo Brewing Company's Jazz Cabbage and The Solvay Society’s Coulomb Dry-Hopped Saison. Pints were a steal at £4 each, but there was plenty of accomplished homebrews also being poured and proffered in exchange for an honest opinion. It was a great introduction – or continued education – to brewing in an extremely candid and welcoming environment. The Braumeister afforded attendees the freedom to socialise and critique each other's recipes while the wort bubbled away. Beer Boars is a new venture from Simon Pipola, formerly of Home Brew Depot, whose micro batch kit was used here. Simon is passionate about promoting homebrewing as an accessible and social activity for all beer enthusiasts. Combining an eager group ready to learn and an impressive line-up of guest brewers, this community-based project is a springboard for anyone, from the curious to the confident homebrewers, to learn about beer. Joining Beer Boars is free, gives members a discounted rate and a early-bird sign-up period for these gatherings (£10 instead of the £12 non-member fee). Granting access to a comfortable open space in Clapton and promoting the opportunity to bend the ear of brewers from some of London's most exciting craft breweries, Beer Boars is a good bet for drinkers toying with the idea of having a go at brewing. The gatherings occur monthly and everyone is welcome to come along to enjoy some engaging discussion in a casual and friendly setting. Even if you're not certain that homebrewing is for you, the evening is surprisingly chummy and nobody will really hold it against you if you'd rather chat about beer instead of making it.